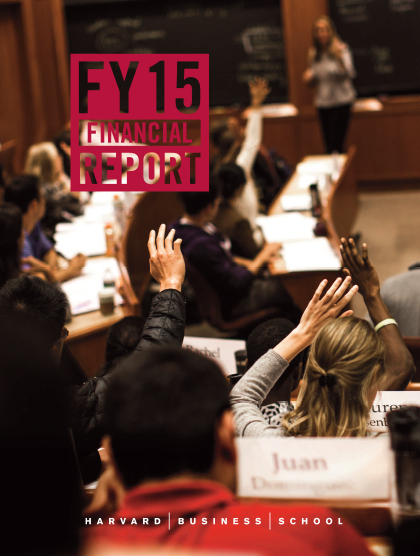 I am delighted to share with you the Harvard Business School Financial Report for FY2015. We feel a special responsibility at HBS to ensure that we are careful stewards of the School’s resources, and that we manage the School in a way that exemplifies the type of high-performing organization our students and alumni themselves aspire to lead. During my visits with friends of the School, and particularly during The Harvard Business School Campaign—a time when we are asking for support to ensure the future strength of HBS—I often am asked how we measure our efficiency and effectiveness. This Financial Report is intended to provide a window into our operations. During FY2015, and building on the priorities that have guided our strategy for five years, we continued to deepen and extend a range of exciting initiatives. In the MBA Program, we launched a new capstone program, Bridges, to help graduating students integrate their learning over two years and prepare for re-entry into the workforce. We broadened the reach of CORe, HBX’s online primer on the fundamentals of business, to a more truly international audience of learners. Here on campus, we made significant progress on the Ruth Mulan Chu Chao Center in anticipation of its opening in June 2016, and on the plans for the Klarman Center, a new space on which we’ll break ground in April 2016, further transforming the residential learning experience that distinguishes HBS. At the same time, we sought ways to further enhance the work we do day in and day out. We began an effort to ensure we are developing the next generation of outstanding case writers among our faculty. We looked to increase alumni engagement, traveling with Campaign events to more than a dozen cities around the globe. Additionally, we launched a new version of hbr.org, the online portal to Harvard Business Review that connects managers with leading ideas in management practice. Our aspirations, past and future, reflect our commitment to reimagining and realizing our mission of educating leaders who make a difference in the world.